The Deutsche Bahn connects Herborn (Dillkr) trainstation with Frankfurt Main. The RB and RE are running on a hourly basis. To get to Herborn simply follow the A5 and A45 to Hannover/ Kassel and then turn on to the B255 direction Herborn, take A45 26-Herborn-West exit and follow the signage to the city center. The airport is only an hour car ride away, simply follow the A5 and A45 to Hannover/ Kassel and then turn on to the B255 direction Herborn, take A45 26-Herborn-West exit and follow the signage to the city center. The Westerwald-Steig is the No. 1 hiking trail within the Westerwald hiking paradise. Interesting sights, breathtaking viewpoints and always changing landscapes accompany the 235 km long Westerwald-Steig. Starting from Herborn the Westerwald-Steig leads to Bad Hönningen am Rhein, in 16 stages between 6 and 23 km. Along fascinating sights, nature lovers find everything their heart desires - enjoy on 235 km breathtaking lookouts and always changing landscapes. Starting point is the market square in Herborn, from here the trail leads the first stage of the bird park Uckersdorf past direction Erdbach. The dripstone cave „Herbstlabyrinth“(Autumn Labyrinth) in Breitscheid is only the first highlight on the Westerwald-Steig. Pass the "Heisterberger Weiher" (pond), from here it goes constantly uphill till you reach the highest point of the Westerwald, the Fuchskaute (657 m). From Rennerod the trail leads to the "Holzbachschlucht" gorge, which has a torrent-like character with down of broken basalt stands. Along the Westerwald lake plateau hikers reach the tertiary and industrial experience Park Stöffel, the largest basalt mining area. Bad Marienberg with the Barefoot path, the basalt - and Wildlife Park, and recently even a climbing forest invites you to a longer stay, before you reach Hachenburg. The monastery of Marienstatt in the "Kroppacher Schweiz" (Kroppach Switzerland) is linked to the convent of Marienthal via the hikingtrail "Marienwanderweg". Memories of the great reformer and founder of the cooperative system of Friedrich Wilhelm Raiffeisen will awake in Weyerbusch and Flammersfeld. Another attraction was created in the renatured Grenzbach Valley: a 300 m-long climbing with a difference in height of 80 m. This continues in the Westerwald-Steig in the valley "Wiedtal". Here, the "Roßbacher Häubchen" (plateau underneath the summit) and the hiking and ski lodge Malberg close to Hausen offer fantastic views. The trail finally leads to Bad Hönningen Rheinbrohl passing Waldbreitbach. At the head of the limes "Caput Limitis" in Rheinbrohl, Roman history is experienced with all the senses. The Westerwald-Steig offers outdoor fun on a well marked trail and even besides the quality trail, the region has a lot to offer. Before heading out, seek for local advice - Westerwald Touristik-Service Kirchstraße 48a, 56410 Montabaur or www.westerwald.info - the office will help to find a route to match your fitness and time frame and can supply you with maps and further instructions. The "B-05 art and design center" is a center for culture and art - organized by private persons and located in a former NATO arsenal. There's a large park with sculptures or just for recreation in the nature, and there are bunkers with exhibitions/installations. Additionally there is a cafe for a break ... and there is a very special atmosphere due to the former military site which has been overgrown by nature. Even outside of the Westerwald Steig, the region has a lot to offer. "Wäller tours" (hiking company) offer certified trails in the Westerwald, in particular for day hikes, is supplemented and enhanced. Since then, the number of Wäller tours in the Westerwald has grown every year. Most tours are round trips, so the hiker comes easily back to their starting point. Cyclists can explore the Westerwald on 10 signposted routes with a total length of over 700 kilometers. Go out and discover the region by bike is an unforgettable experience and perfect to escape from the hustle and bustle of city life. Schloss Hotel Herborn is located in the historic centre of Herbon, just 300 metres from the River Dill and 150 metres from Herborn Castle. The hotel offers wellness treatments and free use of the sauna, hot tub and steam room. This family-run hotel in Mitenaar offers a daily buffet breakfast, free on-site parking and country-style rooms with satellite TV. It is located directly at the scenic Lahn-Dill-Berglandpfad Cycle Path. 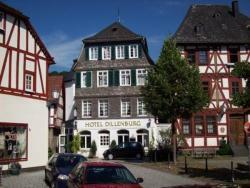 This historic, intimate hotel is situated on the Hüttenplatz square in the centre of mediaeval Dillenburg. The Hotel Dillenburg welcomes you to relax in its individually furnished rooms.